In addition to being a wonderful way to relax, a massage can potentially relieve discomfort and soreness in certain areas. 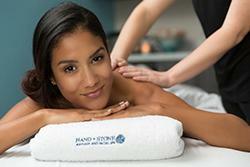 At Hand & Stone in Waukesha, WI, we offer several different options, including Swedish, deep tissue, sports, hot stone, prenatal, and trigger point massages. Through our comprehensive list of services, our mission is to provide something that can benefit each guest who comes to us for massage therapy. If it's been a while since you've been able to take a day or even a few hours for yourself, we firmly believe you should pay us a visit at Hand & Stone. We're known throughout the Greater Waukesha area as a reliable place to receive quality massage therapy. To schedule a visit, give our location a call today.